Which mode of transport is best for getting around Vietnam? Vietnam's oblong shape makes the overland journey from Saigon to Hanoi a long one. Fortunately, there are plenty of interesting stops along the way to break up the long journey. Among other places, many people choose to stop off in Nha Trang for some beach time, Hue for some culture and history, and Hoi An for the pleasant vibe and beautiful setting. Beware: Transportation options between Saigon and Hanoi fill up quickly around large holidays such as Tet (January or February) and Chinese New Year -- book well in advance! Both daytime and sleeper-style, long-haul buses clog the highway between the north and south. While traveling by bus is incredibly cheap, chaotic road conditions provide less scenery and far less sleep than you would get on the train. Buses are also the slowest option for getting around. While they do provide some convenience -- many tourist companies will collect you right at your hotel and tickets are easy to book -- you'll spend hours waiting in Vietnam's terrible traffic to collect other passengers and get out of the city. Always add an hour or two to the estimated arrival time to compensate for rest stops and traffic. Night buses have small, horizontal bunk beds and save you the expense for a night of accommodation. Unfortunately, between the swerving of the driver and the constant done of horns, you'll get little rest. Because passengers ride in a mostly horizontal position, many locals inevitably end up sick on buses; take Dramamine or try ginger if you are prone to motion sickness. Bunks are quite small and are too short for most average-height people to fully stretch out. You can book tourist buses at your hotel or from any travel agency office -- there are many in the Pham Ngu Lao area in Saigon. Going directly to the bus office may save you the commission paid for a booking. Note: Theft is a problem on overnight buses. Be careful of mobile phones and MP3 players which may disappear after you fall asleep. Take the bus only if you need to save money or want the greatest amount of convenience and flexibility. Don't expect to get much sleep on overnight buses! The most scenic way to see Vietnam while moving between points is by rail. The air-conditioned trains show some wear and tear, but they are fairly comfortable. You can have set meals delivered to your compartment or take advantage of food-and-drink carts. Crossing from Saigon to Hanoi by rail with no stops takes approximately 33 hours to cover the 1,056 miles on a sleeper-style train. If you wish to visit Hoi An along the way, you'll need to get off the train in Da Nang then travel approximately 18 miles south via bus or private car. Sleeper trains come in the 'hard' and 'soft' varieties. Hard-sleeper cars -- the cheaper of the two options -- have six berths, meaning that you could be sandwiched between someone sleeping above and below you. Soft-sleeper cars are slightly more expensive but have only four people to each compartment. Luggage is kept with you for security. Simple bedding is provided. The cheapest train ticket, a 'soft seat,' provides you with only a reclining chair in a crammed car. While not luxurious, soft-sleeper trains are the most comfortable option for getting some sleep on the long journey. You can purchase meal tickets on trains that cover a set meal delivered directly to your compartment. Alternatively, you can purchase drinks and snacks from carts that come around sporadically. Free boiling water is available on tap to make your own tea, coffee, or instant noodles. While travel agencies and hotels can book tickets for a commission, the safest option is to book several days in advance directly at the train station. Tickets often get snatched up by resellers who know that tourists wait until the last minute to book. Some unsavory travel agents have been known to sell hard-sleeper train tickets for soft-sleeper prices. You won't be able to confront them once you are boarding your train and find out that you've been scammed! While still a time-consuming option, trains are the most scenic way to see parts of the Vietnam countryside normally inaccessible to tourists. You'll also arrive more rested. 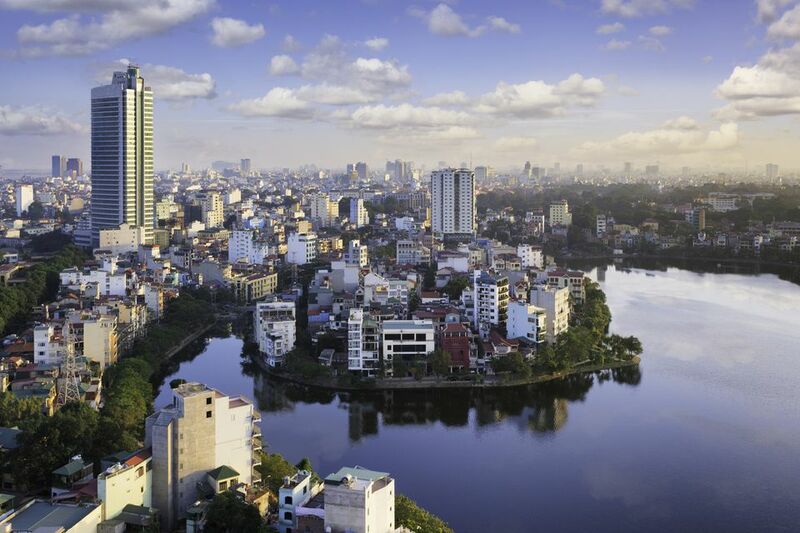 If you're pressed for time, the quickest option for getting from Saigon to Hanoi is by flying. When booked in advance, the two-hour flight is usually less than US $100. Jetstar is usually the cheapest carrier between the two cities. Flights are clearly the most practical choice for turning a 30-hour journey into a two-hour hop, but don't expect to see much along the way.